I have been vexed for some time by the request at the bottom of each letter that I am not to write below the line. I've had a letter from TV Licencing and I'm interested in the statement at the bottom of the page. It says: 'Please do not write below this line'. I would like to know why the letter requests this. The line referred to is about half an inch from the bottom edge of the letter. What will happen if I write there? How would you know? I am not asked to return the letter, so why the request? Thank you for contacting us. Unfortunately I am unable to deal with your request, as you have not provided your address and licence number. If you have moved address I will need both your new and old address. Once I have this information I will action your request and send you the appropriate form or confirmation. I do not have a licence. The letter was sent to me as part of TVL's routine mail-out. It was not solicited by me. Copies of these letters are commonly reproduced on the internet [example]. You will see that these letters say "Please do not write below this line". So did the one sent to me. Please explain to me why I am not allowed to write below the line. The reason you would receive such letters is because we would have no record of a TV licence at your address. The reason you cannot write below the line is because the letters go through a OCR machine, and anything below the line is rejected. OCR is an abbreviation for "optical character recognition", software that scans documents for editing on a computer. Thank you for your reply. You say that I cannot write below the line because the letter will go through a OCR machine, and anything below the line will be rejected. i) I take it from your reply that a TV officer is planning to collect the letter back off me in order to scan it. Please tell me what purpose this serves. ii) Anything I write above the line would also be rejected by the OCR. Why am I allowed to write above the line, if I am not allowed to write in the narrow strip beneath it? A Licensing officer may call at your property not to collect the letters but to check that you are not watching a TV. You may write above the line but as we advised you previously anything written below the line when they go through the OCR machine they will be rejected. If you would like to confirm your address I can up date our records to advise no Television is being watched. Thank you for confirming that I may write above the line. Please explain why, having sent me the letter, you want it back for scanning. Also, please explain how I am to get the letter to you. 6 February 2007: I have a reply from Gary Bessell. Without your address we are unable to amend our records to show that you are not using TV equipment. To return an enquiry letter to TV licensing, simply return it. I don't seem to be getting a straight answer. Thank you for your reply. The purpose of my query is not to ask why you want my address. The information that I am seeking is why you want the letter back for scanning. There was nothing on the letter that said I had to return it. Please note that I am not Miss Scott. 9 February 2007: a reply from Karen Mcallister. The information about returning the letter was not on the letter itself but on the envelope. The only reason we ask you to return the letter is to help us update our records, however if you could provide us with your address we can update our records without you returning the letter. Having kept all my TVL/BBC envelopes, I examined them to see whether any displayed an instruction that I was to return the letter. None did. There was a return address but only was for undelivered letters. I resist the temptation to pursue this point. What I still do not understand is why you would wish to OCR my letter in order to update the records. Obviously, the number below the line must be very important. Please could you explain its purpose. I apologise that it has not been made clear to you. An OCR stands for a Optical Character System. This machine enables us to deal/process with large volumes of information in a relatively short space of time. The OCR machine reads the information below the line and updates the corresponding records on our computer system many times faster than if manually processed. If the information below the line is obscured in anyway the OCR machine will be unable to read the information effectively. The number below the line is a unique number that relates to the specific property that the letter has been sent to. Once this number is read by the OCR machine it will automatically update the computer records that relate to that letter/property/licence/application. I am still not satisfied. If I send a letter back to TVL/BBC, and they scan the number at the bottom, it will generate the same information as they have already got; so, what's the point? Let's compare TVL/BBC's operation to another company. 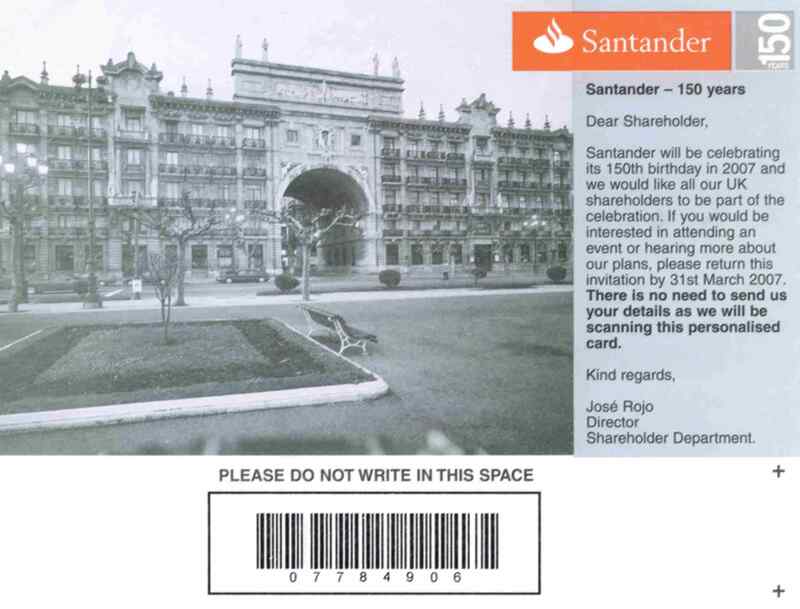 Below is a scan of a pre-paid return postcard from a company called Santander, in which I am a shareholder, which I am invited to return. Santander requests that I do not write below the line but, unlike TVL/BBC, there is an explanation which is on the right hand side. It says that they will retrieve my personal data (which I have authorised them to hold, unlike TVL/BBC) by scanning the barcode and number. This makes perfect sense. TVL/BBC letters, however, do not ask for its letters to be returned, and Cas Scott has said that the letters are not sought by TVL/BBC agents who make street visits. Even if they did collect the letters, the number at the bottom would duplicate the information that they already hold. So, the original question - why we not permitted to write below the line - remains a mystery.